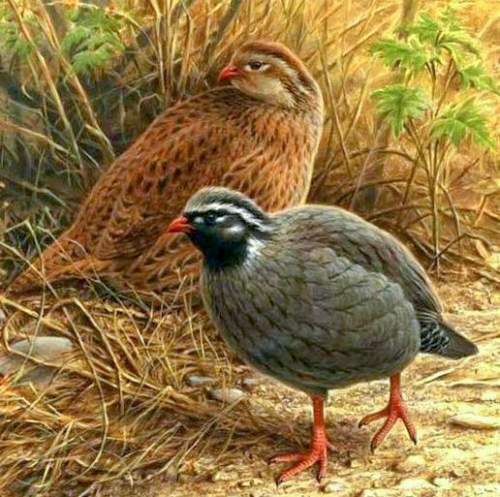 The Old World quails, pheasants and partridges belong to the family Phasianidae under the order Galliformes. 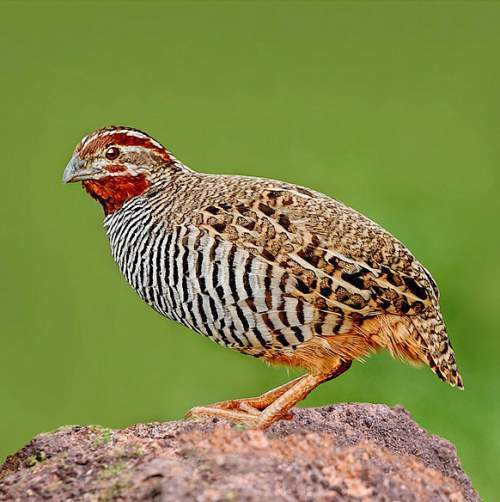 The quail species occurring in the Indian subcontinent are grouped under four genera, viz., Synoicus, Coturnix, Ophrysia and Perdicula. 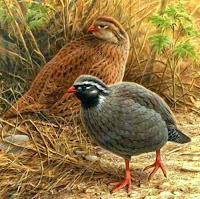 The quail species under these genera are small, plump terrestrial birds. They primarily feed on plant matter, especially grass seeds. They also feed on small prey and insects. These bird species mostly nest on the ground and the clutch may contain 4-8 eggs. The incubation period may last 15-18 days. The common quails and the Japanese quails are fully migratory and the rain quails are partially migratory. The other species are resident birds. 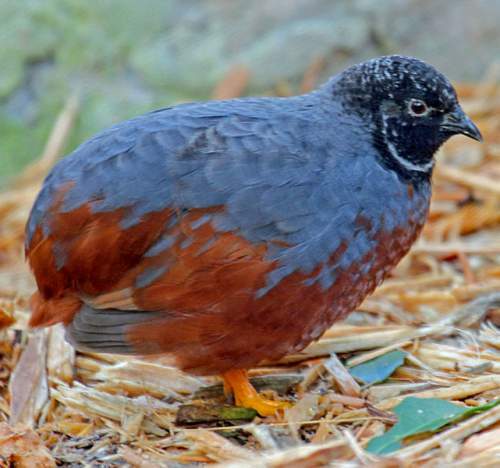 1.The Asian blue quail (Synoicus chinensis) is a non-migratory resident species. It is distributed in the Indian subcontinent, southeast Asia, Australia, southern China and Papua New Guinea. The International Union for Conservation of Nature (IUCN) lists it as of Least Concern (LC). This species in polytypic and comprises ten recognized subspecies. 2.The breeding populations of Common quail (Coturnix coturnix) species are distributed in Europe, west and central Asia and Himalayas. The wintering populations occur in central Africa and Indian continent. Resident populations occur in northeast and southern Africa. The International Union for Conservation of Nature (IUCN) lists this species as of Least Concern(LC). This species in polytypic and there are four subspecies. 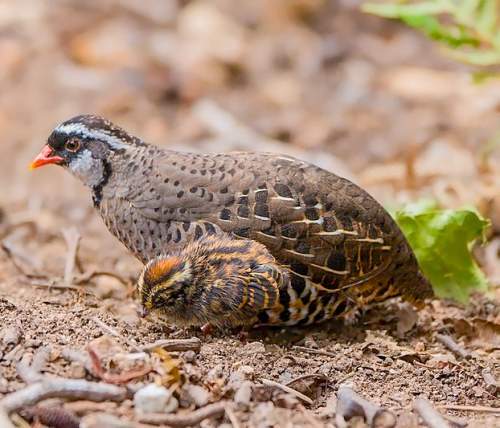 3.The Himalayan quail (Ophrysia superciliosa) is endemic to the southern Himalayas in the Indian subcontinent. It is known from areas around Mussoorie, Dehradun and Nainital, in the state of Uttar Pradesh, India. About 50 adults may be living. It is possibly extinct or on the verge of extinction. The International Union for Conservation of Nature (IUCN) lists this species as CRITICALLY ENDANGERED (CR). This species in monotypic. 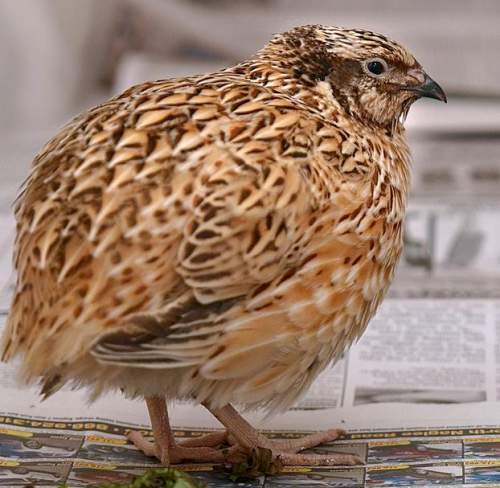 4.The Japanese quail (Coturnix japonica) breeds in northeast China, northeast Mongolia, southeast Russia and northern Japan. The wintering populations are found in southern China, northeast of the Indian subcontinent, southeast Asia, southern Japan, North Korea and South Korea. The International Union for Conservation of Nature (IUCN) lists it as Near Threatened (NT). This species in monotypic. 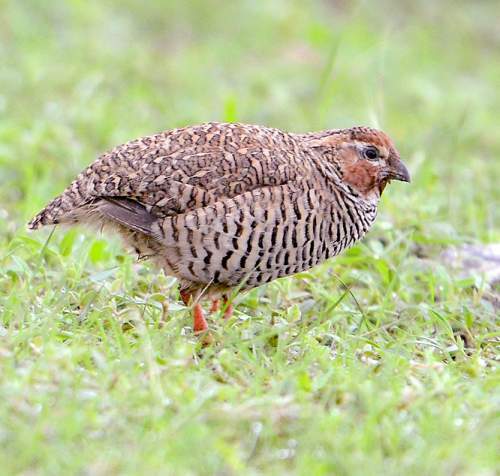 5.The Jungle bush quail (Perdicula asiatica) is distributed in the Indian subcontinent (India, Nepal, Bangladesh, Pakistan and Sri Lanka). The International Union for Conservation of Nature (IUCN) lists it as of Least Concern (LC). This species in polytypic and comprises five subspecies. 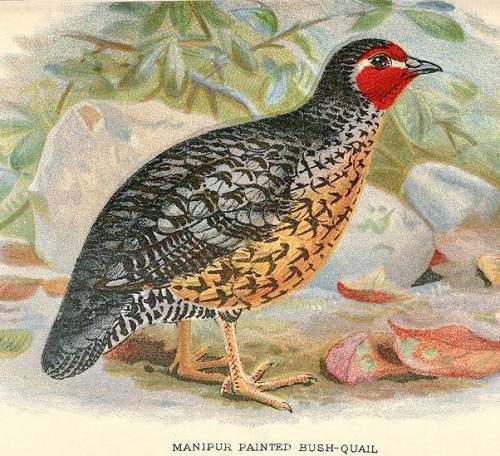 6.The Manipur bush quail (Perdicula manipurensis) is endemic to India. It occurs in the states of Assam, Meghalaya, Arunachal Pradesh, Nagaland and Manipur. It is possibly extant in Bangladesh. The International Union for Conservation of Nature (IUCN) lists it as Endangered (EN). This species in polytypic, comprising two subspecies, viz., P. m. manipurensis and P. m. inglisi. 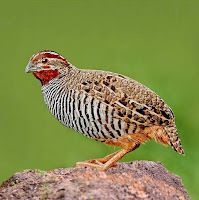 7.The Painted bush quail (Perdicula erythrorhyncha) species is endemic to Indian subcontinent and is distributed in the states of Gujarat, Maharashtra, Karnataka, Kerala, Tamil Nadu, Andhra Pradesh, Odisha, Chhattisgarh, Madhya Pradesh, Jharkhand and West Bengal. The International Union for Conservation of Nature (IUCN) lists it as of Least Concern (LC). This species in polytypic and comprises two subspecies, viz., P. e. erythrorhyncha and P. e. blewitti. 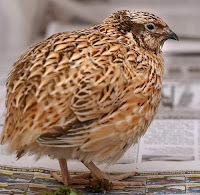 8.The breeding populations of the species Coturnix coromandelica are distributed in the northwest of the Indian subcontinent, Cambodia and Vietnam. Native resident populations are found in central, southern and northeast India, Bangladesh, Myanmar and Thailand. The International Union for Conservation of Nature (IUCN) lists it as of Least Concern (LC). This species in polytypic and there are three recognized subspecies. 9.The species (Perdicula argoondah) is a non-migratory, resident bird, endemic to the Indian subcontinent. It occurs in the states of Punjab, Haryana, Uttar Pradesh, Rajasthan, Madhya Pradesh, Gujarat, Maharashtra, Telangana, Karnataka, Tamil Nadu and Kerala. The International Union for Conservation of Nature (IUCN) lists Perdicula argoondah species as of Least Concern(LC). This species in polytypic and there are three recognized subspecies. 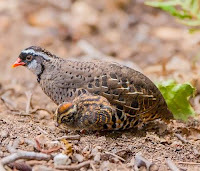 Recently updated and current topic in Bird World: List of Indian quails and images.